Erica 'Lime Soda' in the Leonard garden in Eureka (Designed by Ryan Scott). Whether planted in drifts or used singly in the foreground of a shrub planting, heathers are one of the easiest plants to succeed with on the North Coast. They tolerate harsh coastal winds, aren't bothered by deer, and need only moderate amounts of water once established if they are well mulched and planted in drifts, where the foliage of the surrounding plants helps keep the roots cool. Though most people think of heaths and heathers as one type of plant, there are three different commonly available genera, each of which has something unique to offer. If you combine them thoughtfully, you can use heathers to create a groundcover or foreground planting that will provide vivid flower and foliage color year-round. Though there are a few variegated types, for the most part Irish heath have deep green leaves with slightly larger bell-shaped flowers, which gives them a bit of a textural contrast against the finer appearance of other heather varieties. They are more tolerant of shade than other heathers, and have a long bloom season from May through November. A light midsummer shearing to deadhead and freshen up the foliage (even if they are still blooming a bit) sets them up for a second strong flush of blooms in late summer through fall. Daboecia cantabrica 'Alba' is a white-blooming variety, and the contrast between that dark green foliage and the pure white hanging bell flowers looks fresh and crisp in the foreground of a woodland garden. It reaches about 18 inches tall by 30 inches wide, is widely available at nurseries, and is beautiful next to the exuberant blue flowers of Geranium 'Rozanne'. Daboecia x scotica 'William Buchanan' is another that is easy to find locally, with vibrant magenta flowers covering the plant. A similar size to 'Alba', this color goes well in gardens with a hotter color scheme. Daboecia cantabrica 'Arielle' is a lower growing variety 12 inches tall by 20 inches wide with bright pink to reddish blooms. Though this can be a hard-to-find variety in the trade, it's often available locally at Singing Tree Gardens in McKinleyville. If you've seen the flaming red winter foliage color of C. 'Firefly', or the creamy-gold new growth of C. 'Spring Cream,' then you know why Scotch heathers are among the most popular heathers around. They come in a wide array of foliage colors, and many of them change throughout the year, providing an ever-shifting palette of both leaf and flower color (most bloom in late summer through early fall). They also vary in size, from creeping ones that stay flat and look almost lawn-like, to the more usual upright varieties that reach 24 inches tall by 30 inches wide. There are even tiny rock-garden specimens with tight, congested foliage and the appearance of a miniature green boulder. The one downside to Scotch heather is that unlike some heaths and heathers, it doesn't respond well to stern regenerative pruning, so if you don't clip or shear it every year after bloom to remove the dead flowers, it becomes leggy and floppy over time to where your only attractive option is removal. Calluna vulgaris 'Pat's Gold' is a cheery golden variety that stays flat to the ground, grows about 30 inches wide, and has lavender flowers in mid to late summer. It combines well with the lavender-blue flowers of catmint (Nepeta faassenii) and the apricot-colored blooms of 'Cheviot' sunrose (Helianthemum nummularium 'Cheviot'). Calluna vulgaris 'Wickwar Flame' has light orange foliage in summer which turns a flaming orangey-red with the winter cold. The winter foliage color is a little lighter than the more common C. 'Firefly' (which tends towards a brick red), and I appreciate that extra brightness in winter. Like many orangey-red Scotch heathers, the pinkish-lavender flowers are sparse and hard to see against the foliage. Even if you don't notice many deadheads, do give them an annual shearing to keep the form full and compact. Calluna vulgaris 'Finale' extends the bloom season into October and November, when most other flowering plants are winding down. With fresh green foliage and spiky stems of lavender-pink blooms, it looks great with traditional garden plants and perennial flowers. Heaths encompass a variety of bloom times, foliage colors and sizes, but the one attribute they all share is their fluffy, softly-textured foliage that makes you want to pet them — if it weren't for all the happily buzzing bees enjoying their nectar, of course! There are varieties that bloom in mid to late summer, and ones that bloom during the coldest months between fall and mid-spring. The summer-blooming ones become drenched in brightly colored flowers just as most summer-blooming perennials are taking a midsummer pause, while the cold-season bloomers can carry the landscape from November through May, when the Irish heaths begin their bloom. Though shearing after bloom is always a good idea to keep the form compact and remove all those brown petals, the timing is thankfully less critical than with Scotch heathers. Erica carnea 'Porter's Red' has some of the brightest winter blooms around, with masses of tiny, bell-shaped, magenta blooms covering the dark green foliage. Flowering from January through April, it reaches 8 inches tall and 18 inches wide, making it perfect for massing in front of Rhododendrons and other acid-loving shrubs. Erica vagans 'Mrs D.F. Maxwell' blooms July through September in a shade I can only describe as a very bright bubblegum pink. It has a compact mounding habit around 12 inches tall by 24 inches wide, and when it flowers it becomes so covered in color that the only green you can see is on the tiny stem tips that poke out atop the blooms. Erica cinerea 'Lime Soda' is the color of pure summer sunshine, with lime-green to golden foliage that has an airy appearance. The tips bear little clusters of pink blooms August through September, and it looks great near magenta-blooming summer heaths, purple mophead Hydrangeas and conifers with blue foliage. 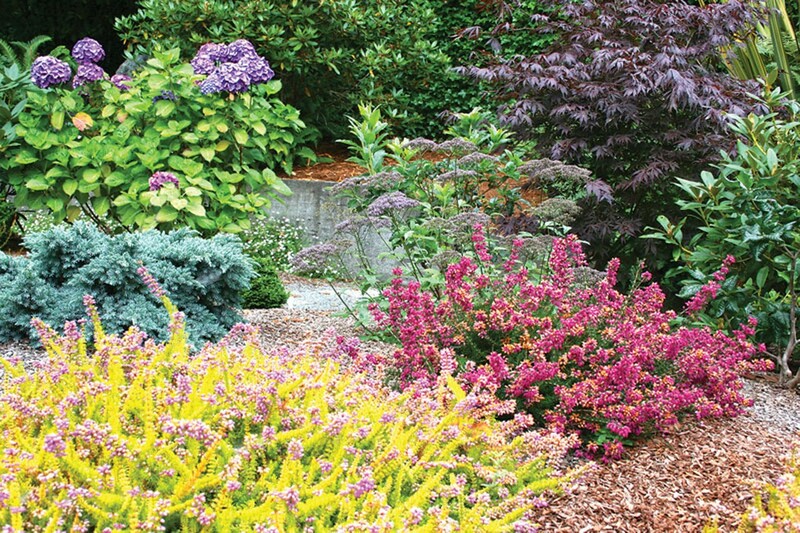 Heaths and heathers are satisfying to grow and very easy, with one unfortunate caveat — their susceptibility to dog urine. Don't put a heather streetside where all the neighborhood Fidos are likely to lift their leg on it, and if you have dogs, plant your heathers in large drifts away from the usual spots they like to mark. Heathers prefer acidic soil, which is not hard to come by in Humboldt as many of our soils tend naturally in that direction. They make natural partners with Rhododendrons, ornamental grasses, blue Hydrangeas and Spireas, all of which thrive in acidic conditions. I use a light dose of organic Gardner and Bloome granular fertilizer for acid-loving plants in spring and again after shearing in early fall, to promote bushy new growth. Growing native plants is one of the best ways to help wildlife thrive in your garden, and fall is the time to plant. The North Coast Chapter of the California Native Plant Society is having its fall sale on Saturday, Sept. 12, from 10 a.m. to 3 p.m. at the Jacoby Creek Land Trust's Kokte Ranch, 2182 Old Arcata Road, Bayside (between Jacoby Creek and Graham roads). Not only will they have plants raised by volunteers, but they'll also have a selection from a few local native plant growers. Knowledgeable volunteers will be on hand to answer questions. For a detailed month-by-month garden to-do list, visit www.northcoastjournal.com/GardenToDo.